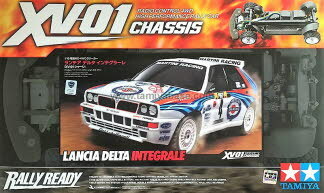 The Lancia Delta Integrale, which has made a number of appearances on various Tamiya chassis platforms over the years, now makes its home on the XV-01 chassis. The Lancia Delta Integrale was a legendary Rally warrior, as fans of the sport are sure to remember, as it won 6 titles back-to-back at the end of the 1980s and start of the 1990s. The 4WD XV-01 chassis offers dynamic R/C rally driving on both tarmac and gravel surfaces. It features a front-motor, belt-driven 4WD layout with front and rear enclosed gearboxes equipped with gear differential units. The box-like main frame incorporates covers and wheel well liners to provide superb protection against dirt and debris. The 4-wheel double wishbone suspension ensures plenty of suspension stroke and ground clearance and is matched with Rally Block Tires on replica wheels for realistic handling. Requires: Radio Control System with 1 Servo, Electronic Speed Controller (ESC) 7.2v Battery & Charger, Polycarbonate Paint for the Bodyshell.